The team at Merit Cleaning is here for all your residential and commercial cleaning in Revesby. Whether you need your home cleaned once or your office cleaned on a regular basis, our team will be there for you. Operating across Sydney’s suburbs, Merit Cleaning is the professional, affordable, and reliable cleaner near you. For commercial cleaning Revesby office managers trust, look no further than our team of experts. Fully insured and police checked, our professional cleaners will come into your office to wipe, sweep, mop and vacuum every surface. We can take care of desks, glass surfaces, monitors, counters, kitchens, bathrooms, and much more. If you’re looking for commercial cleaning in Revesby on a regular basis, Merit Cleaning is the perfect choice. We offer these services on an ongoing basis without the need for a contract, meaning you’re always free to alter things if your needs change. Merit Cleaning also provides a broad range of general and specialised cleaning solutions all throughout Revesby. Need bond cleaning for the end of your lease or strata cleaning that keeps your building up to code? 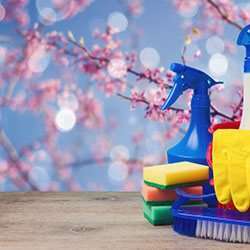 Maybe it’s just that time of year for a good spring clean! Whatever it is, Merit Cleaning will complete the clean for you. Merit Cleaning does more than provide the best commercial cleaning Revesby has on offer. We’re also your expert team for residential and house cleaning services. Say goodbye to contentious cleaning roster and stress less when it comes to big mess. Our professional and affordable cleaners will come to your home in Revesby or the surrounding Sydney suburbs to get the job done. From washing dishes to polishing taps, we take care of every detail – big or small. Want a quote on residential or commercial cleaning Revesby can rely on? That’s easy! Just fill out our online form or call 1300 063 748.